How cells of different types arise in a controlled manner is a core question of developmental cell biology. One way this can occur is by a process known as asymmetric cell division. Stem cells are a cell type that can divide asymmetrically producing another stem cell and a cell committed to differentiate into another cell type in just a single division. This type of stem cell division is frequently found in the developing nervous system of vertebrates as well as invertebrates such as the fruit fly. How do stem cells in the nervous system execute such divisions? This is important to study to understand how cellular diversity in the nervous system is generated. Many of the molecules involved in this process are evolutionary conserved, meaning that they are likely to play similar functions in model systems as well as in humans. In some instances, when the stem cell prepares for an asymmetric division, it establishes asymmetric localization of molecules in the cytoplasm or to one side of the cellular periphery. This set of molecules, called cell fate determinants, is then segregated to only one of the resulting daughter cells, causing the receiving cell to change its fate. What are the molecular mechanisms that allow stem cells do that? A well-studied model stem cell to investigate asymmetric cell division are neural stem cells, called neuroblasts, in developing Drosophila central nervous system. Two possible mechanisms emerged over the last twenty years describing how a molecule involved in cell fate determination known as Miranda becomes asymmetrically localised within neuroblasts. However, these mechanisms conflicted and it was unclear how they could fit together. 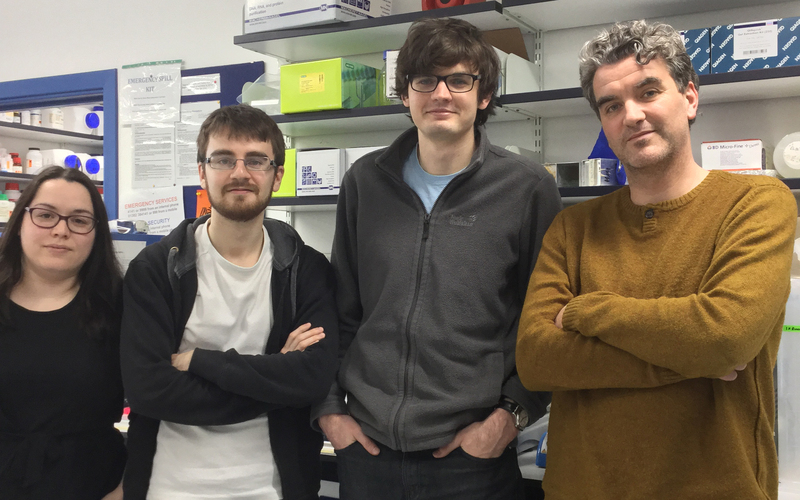 The PhD work of Matthew Hannaford in the Januschke lab in the Division of Cell and Developmental Biology in the School to which two postdocs, Anne Ramat and Nicolas Loyer, contributed, now offers an explanation for this problem, which was just published in eLIFE. Using the powerful combination of Drosophila genetics and quantitative live cell imaging the study reveals that elements of both competing models found in the literature are actually correct. Imaging the dynamics of endogenous Miranda localisation through time using live cell imaging showed that Miranda localization occurs step wise requiring the action of atypical protein kinase C, a member of the evolutionary conserved Par complex as well as stabilizing interactions with the actin cytoskeleton. The findings are important in the context of how cells are polarized, which is mainly driven by the Par complex and a fundamental process during development across species. The findings may further help to understand general principles of how aPKC functions and how perturbations in aPKC function are linked to diseases. Image (from left): Anne Ramat, Nicolas Loyer, Matthew Hannaford & Jens Januschke.